I thought I'd better finish our Berlin trip while I can still remember most of it. The day following our marathon walk, we took the train / subway to about the furthest point we had reached the previous day. 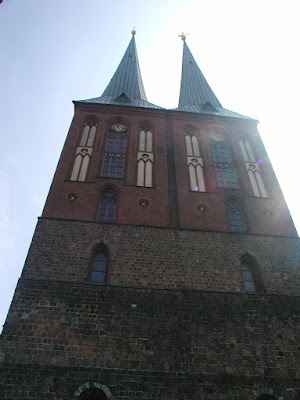 We saw the oldest church in Berlin - it was closed for repairs. 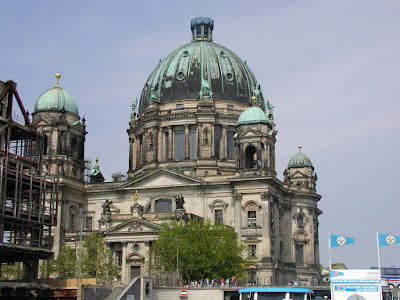 A couple of other churches and we found our way to the Berlin Dom - the Berlin Cathedral. It's spectacular - has two, count 'em two - pipe organs. It's open for tourists like us, plus it is a functioning cathedral. We sat in the back during a prayer service that started just after we arrived. 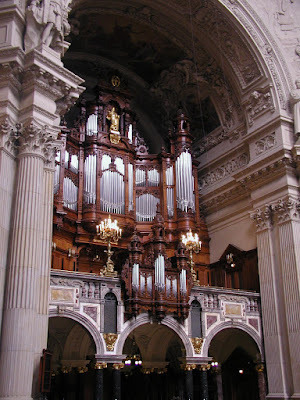 Couldn't understand much, but the music on the main pipe organ was worth the admission by itself. You can climb to the top, and the view there is pretty spectacular. It's a lotta steps, but as long as we were there . 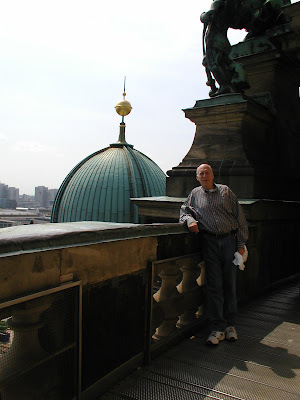 . .
After you finish your tour and wandering around the Dom, you exit down into the basement, through the crypts and into the, yep, you guessed it, the gift shop. Got a bunch of stuff there. We had one of the audio tour things, so while my bride headed to the gift shop, I went back upstairs to the entry to turn in the audio. It's just outside the doors to the sanctuary where there's a guy who checks tickets. So I go out the door, past the guy (within about 2 feet), take the 3 steps to the audio desk, turn it in and get my passport or driver's license or whatever they kept there back, turn around and start back through sanctuary. I heard someone say something, but who'd be talking to me, right? As I turned the corner to go to the stairs, there's this ominous tap on my shoulder. It was "the guy." "Excuse me, sir, do you have a ticket?" "Well, yes I do, but I just came out to turn in the audio tour, and I'm leaving through the gift shop now." "To come in here you have to have a ticket, sir." "Yes, you see, I just came out of here and then came back in so I could leave through the gift shop, where my wife is." "Sir, if you come in here, you must show your ticket. May I see it, please?" "Certainly, here it is." "Thank you. Enjoy your visit." Anyone who thinks the Germans are not sticklers for the rules, think again. They even obey all the "Walk" and "Don't Walk" signs at the intersections. Later, we walked through the Brandenburg Gate again. 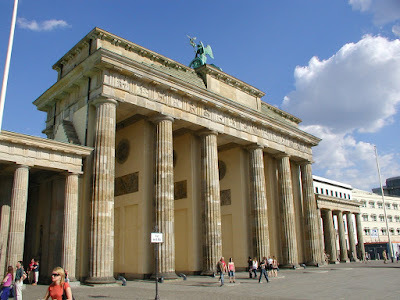 I understand it was one of the old city gates where taxes were collected on goods being brought into Berlin. Near the hotel was the Kaiser Wilhelm church. 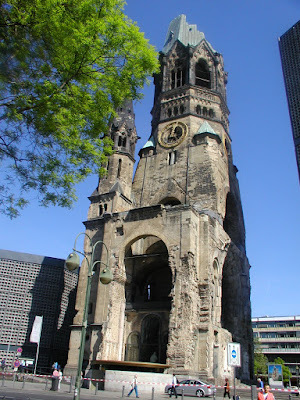 It had been heavily damaged during the bombing of Berlin and was kept in that state as a memorial. A new, modern church was constructed adjacent to it. At the end of our week in Berlin, we had a free afternoon after all the technical meetings had ended, so we took off again. 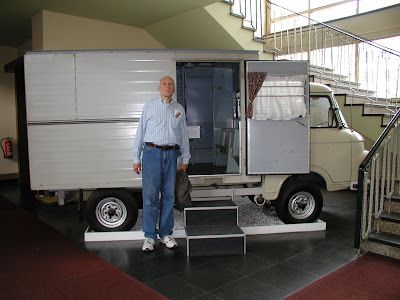 I had scouted out the route to the Stasi Museum - the former East German secret police. Pretty much the East German equivalent to the USSR's KGB. Checked with the concierge on the directions. Once again, I got kind of a "Why do you want to go there?" response, but he helped me out. 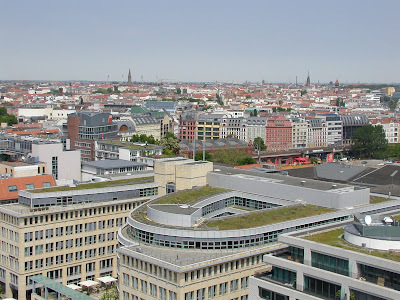 As an aside, we stayed at the Hotel Concorde Berlin. If you find yourself going to Berlin sometime, and can afford it, it's a top-notch hotel. We had to change trains about three times and then walk a bit. 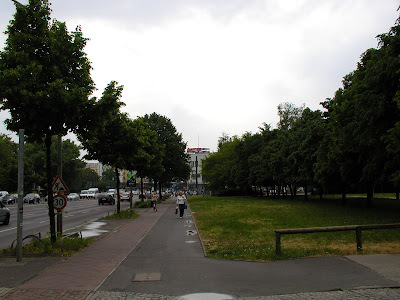 While we were in the Checkpoint Charlie - Friederichstrasse - Brandenburg Gate area, there were not really any significant differences that set the former East Berlin and West Berlin apart. That wasn't the case as we ventured farther into East Berlin. 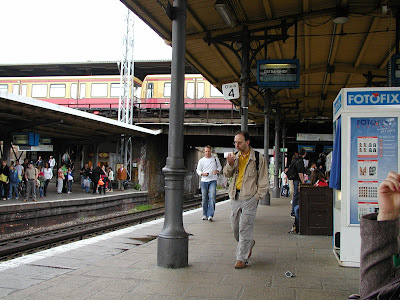 Things just seemed more run down in general - the streets, the stations - everything. Also, we found fewer people who spoke any English at all, although they were still pretty friendly. 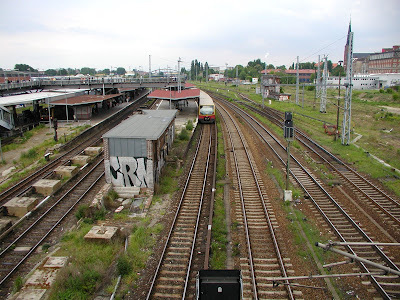 Here are a couple of the stations we went through - Ostkreuz and Warschauer. 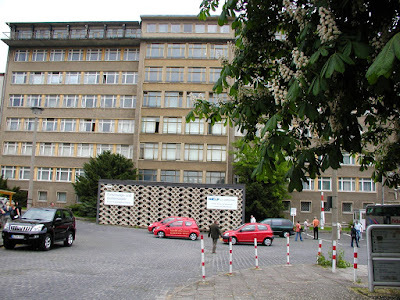 Then it's about a half-mile walk down Frankfurter Allee and then two blocks down a nondescript side street and you are at the former Stasi headquarters. It was interesting, but a bit disappointing because there were no English captions on anything. There was an English guidebook, which we got, but it didn't help with a detailed understanding of what we were looking at. It was pretty easy to understand this ground-floor exhibit. This was the van you didn't really want to see pull up in front of your home. If it did, that meant it was there to take you to the appointment you didn't know you had with a Stasi interrogator or other official. I think there were a lot more people that left home in this van than arrived back home sometime after the ride. Kinda like a roach motel - they checked in but never checked out. On the way back, we spent a couple of hours at the Jewish Museum. It's very impressive, and is not exclusively about the Holocaust, although that's a significant part. There were some other highlights of the week. Our entire group went on a dinner cruise on the river. It was a nice evening, the food was very good, the conversations interesting, and the bar open. We also walked down the street from the hotel to a restaurant recommended by the concierge. Odd sense of walking speed, that guy. "It's only a 15 minute walk from the hotel." We walk reasonably fast - maybe 16 or 17 minute miles. Not any slower than that. Took somewhere around 25 minutes going. I checked later - it's between a mile and a half and two miles. We took our time on the walk back to the hotel. My dinner that night was also the concierge-recommended pig leg. Yeah, it's the whole bone-in leg, roasted and served on a bed of sauerkraut. Not used to seeing that on a plate, but it was really good. All too soon, we were boarding a Continental 757 to fly to Newark and then on to Houston. But it was a great trip - had all of our lunches and dinners outside - good weather pretty much the whole week, uneventful travel, five star hotel, good food, even a productive technical meeting. I'm ready to go back.